Sashimi, as almost everyone knows means thin slices, whether it be fish, meat or vegetables. 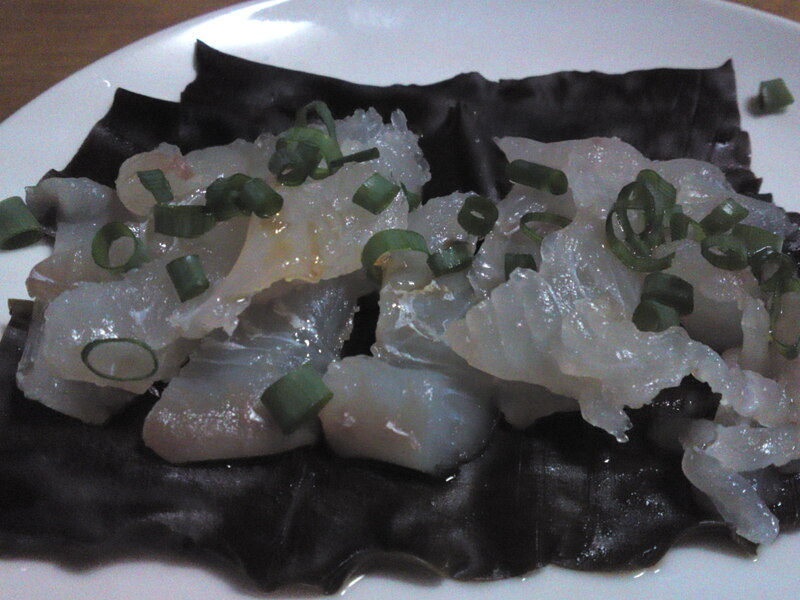 When raw fish, seafood or meat is not sashimi but served raw, it is usually called tsumami/side, snack. Fish and other seafood van be presented solely as sashimi or as a combination of sashimi and tsumami. The possibilities are infinite as there are many ways a chef can cut and present his food. Below I propse a “small” selection of waht can be found in Japan. Can you recognize all ingredients? I suppose you recognize this single sashimi served in Somen/thin noodles style! Elegant and simple individual plate of sashimi! 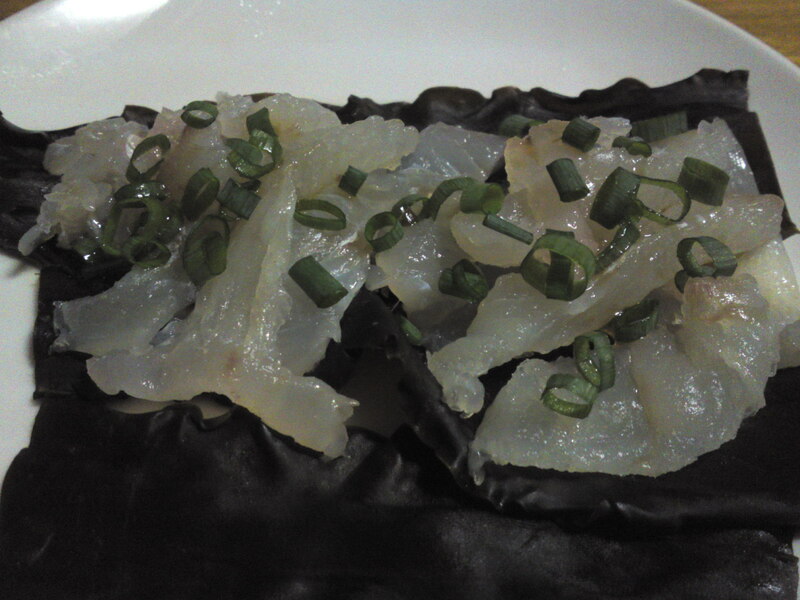 The Missus prepared this tasty sashimi dish as an appetizer for my first cup of Japanese sake last night. The concept is pretty easy and can be reproduced anywhere! 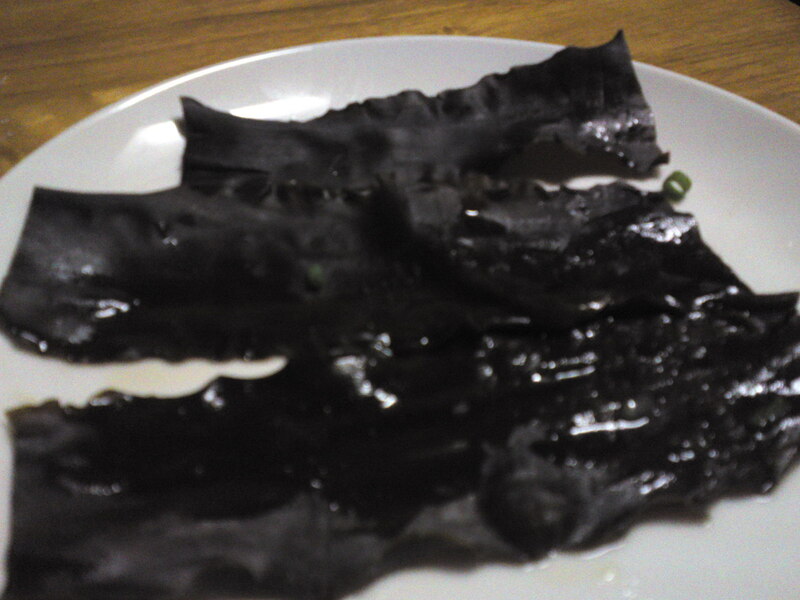 First get enoug konbu/昆布/dry seaweed and brush them with rice vinegar. Wait until they have softened. Drain them if necessary but don’t wipe them. Rub rice vinegar over both sides of the fish. Cut the fish into one-bite-sized slices (or marinate it whole, but the fish will be ready faster this way) and “sandwich” them between the seaweed pieces. Leave in refrigerator for at least 30 minutes. Serve them on the seaweed if you are in a hurry, or more artistically with a little wasabi dressing (or any dressing of your liking, or as it is) and chopped thin leeks. The seaweed can be used in soup or finely chopped and mixed in steamed rice later!